In accordance with the desire of the citizens of the township was called Elmo, and started its official career with its first election on the fifth of the following month. The election was held at the house of L. S. Levorsen, who was a substantial citizen living in section 32. This was one of the two townships organized by the commissioners at their March meeting of that year. It is located in the southeastern part of the county and is bounded by Inman on the north, Folden on the west, Parkers Prairie on the south, Woodside on the east. This township is almost out of the lake region, as there are only six small lakes within its limits. Wing River lake is the largest of these and forms the head waters of Wing river. The water shed of Wing and Leaf rivers runs northeast and south-west through this township. The southern half is drained by two small streams which are tributaries of Wing river and empty into it at the north-western corner of section twenty-four. The northern part of the township is drained into three small lakes in sections 9 and 4, which are the head waters of Leaf river. The farms in this section are under good cultivation and farmers are very prosperous. The Minneapolis, St. Paul & Sault Ste. 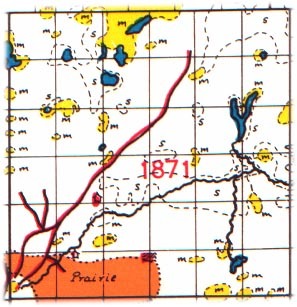 Marie railroad runs northwest through the entire length of the township, entering in section 33 and leaving at section 6. There is only one station on this road; Almora, which is the only town platted within the limits of the township. Its plat, made by Martin Aalberg for Cyrus A. and Ada B. Campbell, was recorded October 3, 1903. Places of birth for Elmo Township in the 1905 state census.